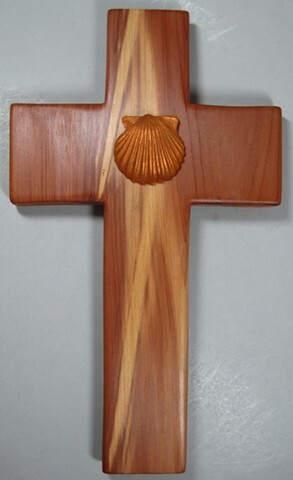 This cross was a custom creation for a baptismal gift. The coloring of the cedar looked like rays of light or water pouring down. The scallop shell is a symbol for baptism. We do accept custom orders but no 2 pieces of wood are alike and we rarely see wood with this type of coloring pattern.